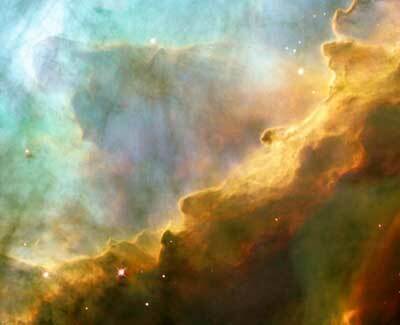 (Nanowerk News) Physicists at the University of Innsbruck are on the hunt for nitrogen containing molecules in space. Using terahertz spectroscopy, they directly measured two spectral lines for one particular molecule for the first time. The discovered frequencies are characteristic of the amide ion, a negatively charged nitrogen molecule. With the spectral lines now determined, this species can be searched for in space. In 2014, astrophysicists discovered a spectral line in observational data from the Herschel Space Telescope and tentatively assigned it to the amide ion. It would have been the first proof of the existence of this molecule in space. Physicists within the group of Roland Wester from the Institute of Ion Physics and Applied Physics at the University of Innsbruck have now shown this assumption to be incorrect (Physical Review Letters, "Rotational Spectroscopy of a Triatomic Molecular Anion"). In addition to stars, galaxies are populated by regions that contain gigantic dust and gas clouds. Such regions, making up the interstellar medium (ISM), act as the birthplace for new stars which form when the clouds collapse under their own gravity and reach sufficient densities for fusion reactions to occur. In order to better understand these processes, it is important to know exactly the chemical composition of the ISM which is most often determined via the frequencies (spectral lines) measured by radio telescopes. 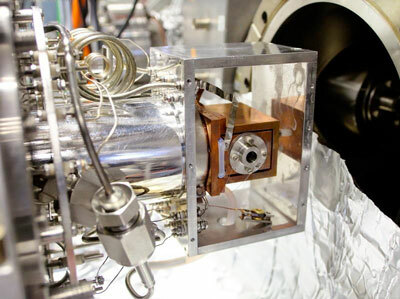 In the case of the amide ion, the team led by Roland Wester has measured two previously unknown frequencies in the laboratory for the first time. The adopted method, known as terahertz spectroscopy, has allowed the lines to be determined a hundred times more accurately than was previously possible. "In this technique, wavelengths between microwaves and infrared light are used," explains the physicist. "This allows the rotation of very small molecules to be studied. For larger molecules, vibrations of whole molecular groups can be determined." In a project funded by the European Research Council ERC, the group of Roland Wester has developed a method by which molecules confined in ion traps are excited with terahertz radiation. "The amide ion consists of a nitrogen atom and two hydrogen atoms, looks just like water and behaves very similar in terms of quantum mechanics," says Olga Lakhmanskaya from Roland Wester's team. "For the first time, we directly measured the elementary excitation of the rotation of this molecule." The proof also came about thanks to a close collaboration with the theoretician Viatcheslav Kokoouline of the University of Central Florida, who was a visiting professor at the University of Innsbruck for a semester. The physicists from Innsbruck have now been able to show that the previously measured spectral line cannot be produced by amide ions by comparison with the data obtained from the Herschel Space Telescope. "We were able to show, with our measurements, that this tentative assignment is not correct," stresses Roland Wester. In the Universe one can find various nitrogen molecules such as ammonia but, according to the Innsbruck experiments, it remains to be shown that the amide ion is also present. The second spectral line determined by the physicists however could assist in searching for this species in space. "We hope that in the future, with new telescopes, this line can be observed leading to its detection in space." Wester?s team now wants to apply the new method to molecules with four or five atoms, where vibrations and rotations are much more complex than with the triatomic amide.